Halloween isn’t just for kids. 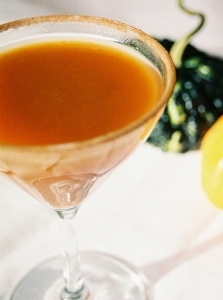 Give yourself an adult size ‘treat’ with this Pumpkin Pie Martini, that the famous Kelly Liken restaurant in Vail, Colorado handcrafts for their own guests. Combine first 4 ingredients in a shaker with ice. Shake. Top with sparkling wine. Strain into a chilled, cinnamon sugar rimmed martini glass. Combine all spices in a shallow pan and toast lightly in the oven for 5-7 minutes. Remove spices to an oil filter and tie closed to form a teabag. Combine water and honey in saucepan. Add spice bag and bring to a boil. Remove from heat and allow to steep for 10-12 minutes. Remove teabag and allow to cool.